Garden of Life Oceans 3 Healthy Hormones is a menopause supplement targeted at promoting well being and health for women. Combining the health benefits of omega 3 fatty acids with herbal extracts used traditionally for treating menopause side effects, this supplement enjoys a fair share of positive reviews from users. The manufacturer also emphasizes the use of pure, high quality ingredients, a requirement for any successful supplement. Here is what we found out about Garden of Life Oceans 3 Healthy Hormones. What Does Garden Of Life Oceans 3 Healthy Hormones Contain? Wild hops are known to reduce hot flashes caused by menopause, while ashwagandha extract contributes to general well being by reducing stress effects on the mind and the body. Omega 3 fatty acids are very useful for supporting hormonal health, imbalance of hormones being the main cause for the side effects experienced by women going through menopause. However, we notice that other traditionally used remedies, like black cohosh and passiflora are not on the list, so there may be other products on the market more effective that this one. Garden of Life Oceans 3 Healthy Hormones must be taken in doses of three capsules daily. The listing price for this supplement is 48.61USD. Garden of Life Oceans 3 Healthy Hormones is sold in bottles containing 90 capsules, or enough for one month supply. The manufacturer does not offer any clear guarantees on their website. Garden of Life Oceans 3 Healthy Hormones is sold through third parties, so refunds must be requested through them. 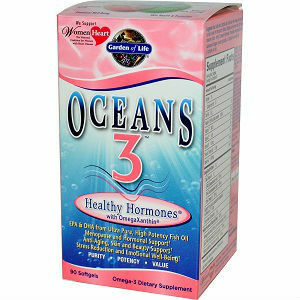 Garden of Life Oceans 3 Healthy Hormones seems to be a good product for reducing hot flashes in women with menopause. The combination of omega 3 fatty acids, vitamins and herbal extracts is beneficial for general well being, but we are not sure how efficient it can really be for addressing all the issues experienced by women as they age. Jackie Horowitz	reviewed Garden Of Life Oceans 3	on September 22nd	 and gave it a rating of 2.5.